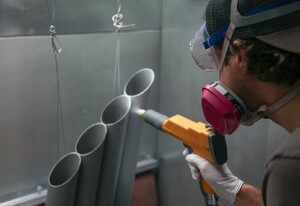 Powder coating is a durable, simple to apply, easy to clean up, product. It is inexpensive, and more environmentally friendly than paint, as it has no VOCs and no solvents are used. The final product is more durable than paint, and powder is available in different colors and finish types. The sand blaster can be used on metal, wood, glass, mirror, plastics and almost any material that is rigid. It will remove paint, rust and mill scale, as well as cleaning welds. (The parts must be baked at about 200 degrees for 15 minutes, so it will not work on magnetic items, or anything with grease in the part, like bearings). In this Safety and Basic Use class, you will learn how to use a cabinet sandblaster to prepare a small metal part, clean and coat it with powder, and then bake it on in the powder coat oven. Note: The sandblast cabinet and powder coating oven are large enough for motorcycle frames, bicycles and many other bulky items. Visit us to check the oven size if you have a specific project in mind.